On the other hand, arguably the sensations of the day to day physical world distract us. So that we do not experience the existence of any spiritual reality beyond it. Hindus, Buddhists, Theosophists, and Anthroposophists, amongst others, give accounts of events after death which are basically very similar. They say that after death the soul consists of the astral body. The personal consciousness fully parts from the physical body. The light of truth then reviews one’s past life in depth. One re-experiences desires and emotions, the soul perhaps inflicting its own purgatory on itself. This suffering is said to bring purification after which the astral body too is allowed to dissolve away. There is a fascinating account of the astral plane actually arising from personal experience lasting many years. Eighteenth century visionary, Emanuel Swedenborg, wrote it. He called this astral plane of life ‘the world of spirits’, a transitional level of the ‘spiritual world’. Our inner world of mind consists of this spiritual world. We usually are only fully consciousness of it after our bodily death. Swedenborg wrote that there is nothing that a person has ever sought in him or herself or done in secret that can be concealed after death. All things and each single thing are then laid open as clear as in daylight. However he says others do not suddenly see all the secret things in one’s life. Our inner character only slowly can manifest. But in this way others eventually see our selfish attitudes for what they are. We can choose to turn away from them. In so far as we do not do so we suffer the consequences as a sort of self-inflicted punishment. Tibetan Buddhism teaches something similar to this. The Bardo is a state between death and rebirth. ‘The Tibetan book of the dead‘ describes the individual being aware of a radiant colour light of pure reality. This is the chance of the self to obtain Nirvana, by abandoning ego existence and becoming one with the light. But most souls don’t want to be reunited with the light of this stage. The self then acquires A karmic body forms itself by the action of past thoughts and deeds. It encounters all the deities that are projected by its own mind. These are both benign and vengeful, loving and judgemental in accordance with its beliefs and conditioning whilst on Earth. Judgement and punishment follow. 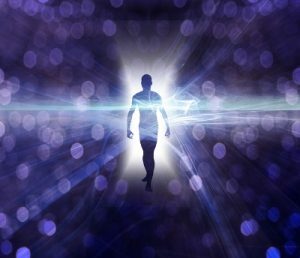 Many people assume that the astral body gravitates to a level appropriate to its make up on the astral plane. This is probably the reason that some religions insist that right emotions are more important that actions or beliefs. Similarly, Swedenborg would say that the crucial thing is one’s intentions. However, he fastens on the general intention that rules our heart. According to this idea underlying all the various interests, desires, goals we have is one pervasive and prevailing love. This is the underlying love that rules each of us. It develops through many personal choices made in life. The things that please us most show our main love. In Swedenborg’s ‘world of spirits’ your ruling love points you in one direction or its opposite. Let’s consider those souls ruled by good intentions. He claims that right thinking replaces their illusions. However, illusions will replace the insights of those ruled by selfishness. As this process takes place he says the person gravitates to the community of like-minded souls. In other words, we surround ourselves with thought forms in keeping with our astral states.. Our desires and emotional attachments rule our existence. I would suggest that in this way we form our own heaven or hell. Previous Previous post: Abstract Art – Can It Evoke The Spiritual? Next Next post: Reincarnation or Spirit Survival?